Comfort and yoga go hand in hand (or at least it should). After all those stretches and poses, the last thing you need are shoes that’ll leave your feet tingling with pain. Selecting the correct pair of yoga shoes will make the difference between an enjoyable yoga session and an uncomfortable one. That makes choosing a pair of yoga shoes that fit well and provide you with support is the best decision you can make for your feet as well as you overall health and state of mind. So why not select a pair that’s as flexible as you are? Though there’re many shoes to pick from this doesn’t have to be a daunting task. Are Your Toes Comfortable in the Yoga Shoes? The right shoes should give you the necessary support to aid in your body posture and assist with balance and stability. Now let’s go through a few factors to consider so you can hold those poses for much longer. While comfort is important you can still turn heads in your yoga class by picking a fashionable pair of yoga shoes. Who said you can’t have both style and comfort? A chic pair can boost your confidence before you even start with those stretches. After all when you look good you feel good right? But before we get into what to look for let’s discuss the importance of yoga shoes. In case you thought any pair would do allow me to convince you otherwise. If you’re new to yoga you might be wondering whether yoga shoes are really necessary. Isn’t going barefooted much more comfortable? While the idea may sound appealing you might want to consider the germs and bacteria lurking on the floor. Yoga shoes will protect you from bacterial infections and discomfort. With any form of exercise you’re prone to injuries. There’s a lot of stretching involved resulting in pressure being exerted on your joints and bones, particularly your ankles and feet. Wearing a pair of shoes that offers you maximum support will not only optimize your performance but reduce the risk of injury. Want to master that tree pose or the perfect Vrksasana? Some yoga feet poses require you to be on your tippy toes. Ask any serious yogis and they’ll tell you there’s a lot of arching and pulling of muscles involved. All of this can cause considerable strain on your body (feet included). Wearing the correct pair of shoes will allow you to maneuver these positions with ease; not only easily but correctly by improving your balance and aligning the rest of your body properly. Now that you know why it’s important to own a pair let’s discuss what to look for if you want a good buy. Comfort has to be at the top of your priority list when looking for a pair of yoga shoes. A wrong pair will make the session appear seemingly longer than it actually is due to discomfort. Ideal yoga shoes must ensure that your toes are supported properly. This will go a long way in aiding your balance. Look for a pair of shoes that don’t cramp out your toes but rather give them room to spread out comfortably. Shoes that mimic the natural shape of your feet and toes will increase the quality of your grip on the floor. Contrary to public opinion, yoga isn’t just a series of simple stretches but it’s also a very serious workout routine. Yes, serious enough to break a sweat. The last thing you need is sweaty feet drawing away your attention from the business at hand. That’ll definitely dampen your mood and feet, literally. Opt for a pair that is breathable. Make sure you evaluate the patented moisture control the shoes come with. This way you’ll know the level at which the shoes help keep sweat build up at a minimum. Yoga shoes are made of a variety of materials including polyester and rubber. Will the fabric of your shoes make any difference? Sure, shoes lined with polyester and other materials may be affordable but that fabric does nothing for keeping any odors at bay. Is it affordability or comfort? You decide. Rubber shoes may be comfortable but they’re also known for locking in moisture and heat. Rather opt for yoga shoes that are made of leather or canvas. These types are well known for being porous which will do wonders for your feet. While on the subject of fabric investing in a pair of lightweight cotton socks will be to your advantage for increased ventilation. If you’re planning on doing some advanced poses pick yoga shoes that are made of neoprene. This material comes with non-slip technology which will go a long way in increasing your grip. These yoga shoes come in different styles so you’re bound to find one that matches your personal taste. These shoes will make sure your toes are individually wrapped like a glove for your feet to offer maximum comfort. They’re incredibly thin shoes that resemble socks more than shoes. The soles of the shoe socks will help improve your grip on the floor. These types of shoes look more like pairs of sandals that expose the top parts of your feet while wrapping your toes. They usually tie at your ankles. This style makes sure you still have the natural shapes of your feet for better grip. Want your yoga shoes to last? Handle them with care. Even if they’re made of superior quality that should make you want to protect your investment more don’t you agree? How do you do this? Thankfully most companies are making shoes with inserts. All you need to do is remove the inserts and throw them in the washing machine with the rest of your yoga attire. As for the actual shoes you can simply leave them out on the porch to air dry. Yes, that means taking them out of your gym bag as soon as you get home. This minimizes any unpleasant odors they might have. Thinking of just quickly jerking your shoes off after a tiresome session? Think again. Always take time to lace and unlace them properly with each wear. This will help keep the lacing systems intact and increase their durability and effectiveness. Looking for yoga shoes that provide you with everything from comfort, support to protection and flexibility? Then you might like these. 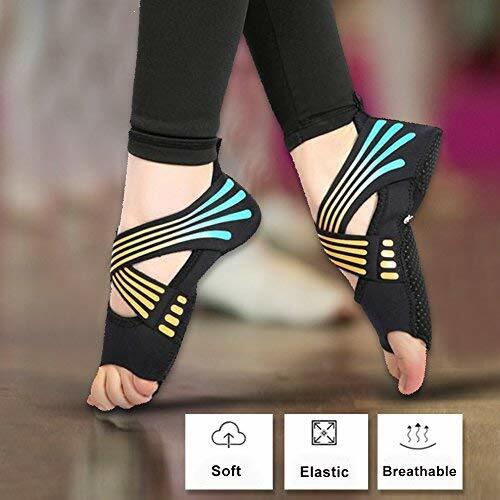 These ballerina yoga shoes have heel tabs that will provide your soles with that extra comfort and protection. Your foot can enjoy that extra lift and support thanks to the arch band. The pair comes with patented non-slip grip soles so you’re guaranteed secure foot placement. If you want shoes that make you feel like you’re not wearing any then you might appreciate the open foot design. This pair is an excellent hygienic alternative to practicing yoga bare foot. The 5-toe design will help improve your movements and anchor the sock to your feet, thereby preventing bunching and twisting. However note they may feel tight with the initial wear but don’t be too quick to discard them, with time they’ll stretch out. These shoes will allow your toes to spread comfortably and also provide you with safety and traction. Best of all you’ll look stylish while doing those yoga poses. Q: Do these socks stick on a yoga mat? Having a pair of yoga shoes that offer both quality and beauty is every yogis dream. You’re guaranteed that combination with these Hylaea yoga socks. These socks are made of such superior quality you’ll want to wear them over and over again! The silicone gel grips on the bottom of the shoes provide you with non-skid surfaces so you don’t have to worry about slipping during your yoga session. They’re designed in such a way that allows your toes to move freely. You don’t have to worry about sweaty feet with these socks thanks to the material which help keep your soles dry and clean. These socks come with anti-slip grip soles and reliable arches to give your feet support while exercising. You’re guaranteed to enjoy that bare foot sensation of freedom and ultimately improve your balance. However, I must warn you the 5-toe design requires you to set aside a couple of minutes to carefully wear these. A rush job simply won’t cut it if you want to fit your toes comfortably inside the toe separations. They come with a mesh pocket for easy storage and protection during machine wash for your convenience. Q: What are the washing directions? A: You can machine wash them in cold water. Step out in style with these Great Soles socks which are designed to give you a molded grip to provide all the contacts on your foot with stability. Tired of yoga socks that slip off mid-session? 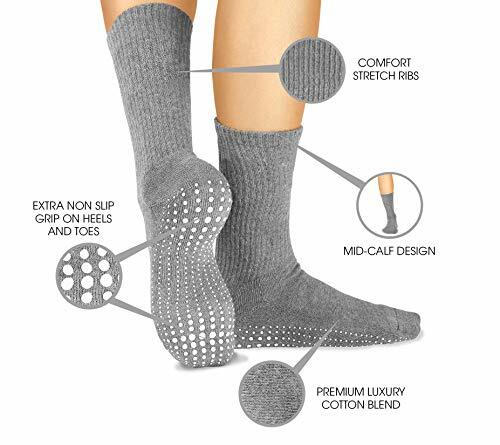 Then you’ll like the never slip strip found inside these socks which ultimately keep your socks in place and securely on your feet. You’ll never look plain with these socks that have a ballerina-inspired design guaranteed to spice up any yoga outfit. Made of premium quality cotton they’re definitely designed for comfort by keeping your feet nice and cool throughout your routine. We love that you can wear them with or without shoes. You can choose to wear them at home or in the studio; they’ll still provide you with the necessary stability you desire. Q: Are they good for carpeted studios? If you’re looking for lightweight shoes for your yoga routine, these might just be the right choice for you. These ultra-light socks are made of chloroprene rubber material which makes them very flexible and comfortable. If you’re a newbie in the yoga field you might want to get these socks. 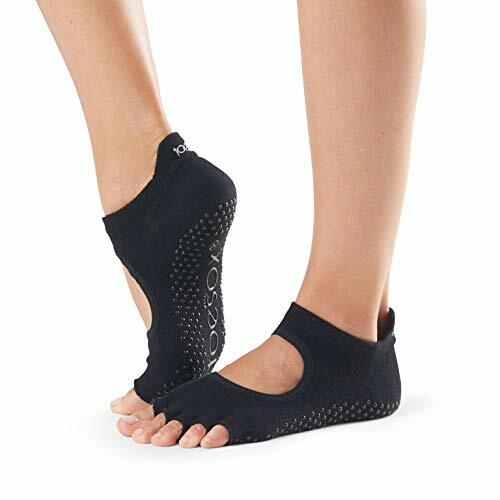 They have anti-slip dots on the bottom of the socks to provide you with better stability and balance while doing your yoga. The increased balance will keep you from falling as you try and figure out the poses. This ultimately means fewer injuries. Yoga is all about flexibility right? The open toe design makes you enjoy both flexibility and comfort. They offer a barefoot like feeling for your comfort which is a plus. And with three different sizes to choose from you’re guaranteed to find your correct fit. You also don’t have to worry about smelly feet thanks to the ultra-soft sweat releasing wrap they come with. Your feet will stay cool and fresh while you stretch away. A: They weigh between 68 to 81g depending on the size, making them ultra-light. Comfort and stability are synonymous with these LA Active yoga socks. These cushioned socks are designed to offer you maximum protection while you engage in your yoga routine. If you want socks that provide you with extra support you might like these because of the non-slip and functional grips they have. With such a protected fit and functional grip pattern they might provide you with the comfort you’re looking for. The custom designed dot pattern helps maximize traction on any surface without adding pressure to the bottom of your feet. Say goodbye to blisters with this classic crew design which protects your feet without compromising your grip on the floor or mat. If you want yoga socks that are thick you might like the premium cotton blend material these socks are made from. If you’re tired of taking ages to slip on a pair of yoga socks you’ll like this quick slip on and off design. These ribbed socks stretch making wearing them a breeze. A: Despite their thickness they do provide some degree of ventilation because of the cotton material. 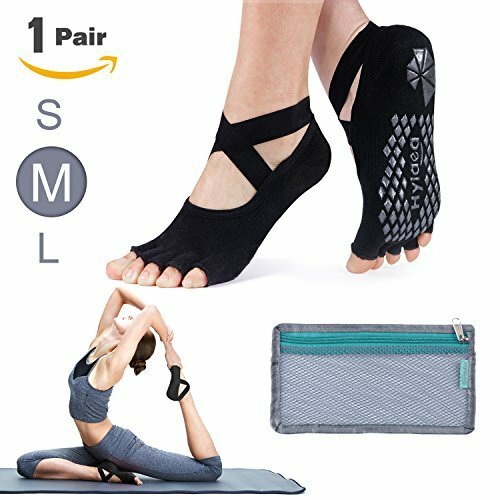 Which one would you pick as the best yoga shoes? Firstly, allow me to point out that a good pair of yoga shoes or socks must offer you comfort, support and flexibility. With that said I’d pick the Hylaea Yoga Socks for women. I’m all for fashion with a purpose. You can definitely make a statement with these stylish socks that are made of superior quality fabrics. The silicone gel grip at the bottom is a winner because you’re guaranteed increased stability. So you can use them in indoors or outdoors and even on those slippery surfaces thanks to the non-skid feature. Your toes are able to move freely making yoga that much more comfortable and enjoyable. Best of all you don’t have to be self-conscious about sweat and stench because they’re made of a fabric that keeps both under control. So now that you know what to look for go ahead, step out in style and take your Yoga to the next level!